Look at this spot (if your browser can). 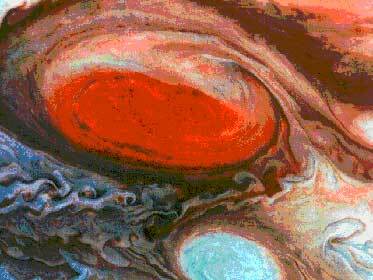 This incredible image is from a photo of Jupiter. Wonder about it. What is it? Where is it located? How long has it been there? What does it have to do with you? Astrology nowadays, at the close of the 20th century and the second millenium since Christ, has largely lost its soul. Entertainment and fast and easy answers are the prevailing themes. It is understandable in our times, which emphasize outer activity, materialism and scientific explanations, that astrology has largely followed the same trend. It is mainly predictive, concerned with outer events, concrete and literal situations rather than inner imaginative activity, and seeks to prove itself as worthy of respect by using computers and statistics. But why should astrology try to prove itself by the measure of values that are being proven to be a failure every day (by the technological destruction of the earth)? Astrology should not be chasing after the 20th century intellect to prove it is a statistically valid predictive tool. The more it does this, the more it is losing its way, and its heart and soul. Instead, astrology is the sacred vessel that still holds the potential of reuniting us with our surrounding and containing Universe. By consciously observing the meaningful interplay between the planetary cycles in the heavens and our lived experiences, we rebuild the once common sense that we are living participants in the intelligent though mysterious processes of the Universe, not exiled and abandoned in a random and meaningless wasteland. It is also understandable that people in crisis turn to astrology for answers. And the prevailing astrology seeks to respond. But what is lost in the process, and what is crucial, is what people are really starving for: to embrace, honor, and learn to trust the Mystery of our existence as we live it each day. This Mystery is found within. Astrology is a gift from our earliest origins, able to direct our seeking to our inner resources. But astrology must resist the temptation to supply answers and only answers. If only astrologers could begin their responses with "It really is a mystery, isn't it?". By succumbing to the pressure of the seeker for answers ("my problems must be explained, because I cannot bear to face the emptiness of not knowing") and the need of astrology to impress the world with its skills, astrologers fail the seeker's real need, fail even to recognize it. And this too is so understandable, in a world where explanations are an addiction and mysteries are to be feared. Astrology can still guide us to the emptiness, the unknowing, the open space in us where we might eventually hear our own answers. How? By evoking wonder. By asking the right questions instead of being so quick to give answers. To embrace and honor the mystery of astrology means to admit and even to celebrate that none of us has any idea of how astrology works. Theories are theories, not answers. They are "as if". We do not have to give in to the pressure of a world addicted to explanations. There is nothing dishonorable about honoring a mystery.